The Map Maker at Work, from Nova Reperta (New Discoveries), 1580. Courtesy of The University of Texas at Austin General Libraries. The Southwest remained a land of mystery long after the rest of the continental United States had been surveyed and recorded on maps. Crossroads of Empire: Early Printed Maps of the American Southwest details the fascinating story of the discovery, exploration, and settlement of the area. This exhibition conveys the romance of maps, the legacy of mapmaking, and the profound influence of early mapmakers on our world today. Crossroads of Empire is an exhibition organized by the Amon Carter Museum and The University of Texas at Arlington Library, and produced by Humanities Texas, the state affiliate of the National Endowment for the Humanities. 41” x 33” x 9” - 98 lbs. 81” x 8” x 8” - 45 lbs. Crossroads of Empire press release. Credit: Le Nouveau Mexique et La Floride, by the first Royal Geographer of France, 1656. Ragsdale Collection. Optional Caption: Published in 1656 by the first Royal Geographer of France, this map places a ring of mountains around French claims and depicts California as an island. It is one of many fascinating maps featured in "Crossroads of Empire: Printed Maps of the American Southwest", an exhibition from Humanities Texas, the state affiliate of the National Endowment for the Humanities. It can be seen at Location/dates/time . 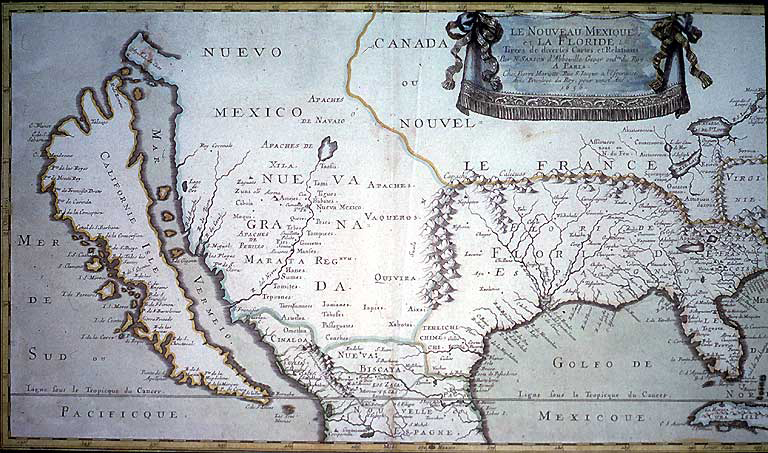 Le Nouveau Mexique et La Floride, by the first Royal Geographer of France, 1656. Ragsdale Collection.